삼성 갤럭시 LoL 게임단 주축 선수들이 연이어 팀을 탈퇴했다. 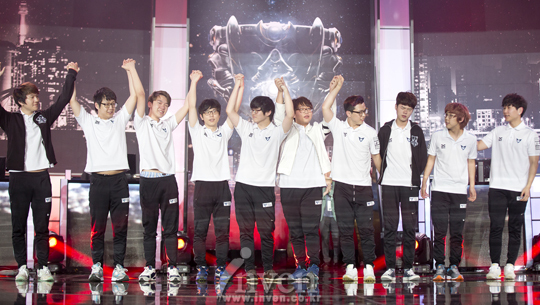 Key players from Samsung Galaxy LoL Division consecutively withdrew from the team. 1일 리그오브레전드 e스포츠의 한 축을 담당했던 삼성 갤럭시 선수들이 팀을 나온 것으로 보인다. 자정을 기점으로 삼성 갤럭시 화이트의 ‘임프’ 구승빈, ‘폰’ 허원석, ‘댄디’ 최인규와 삼성 갤럭시 블루의 ‘데프트’ 김혁규가 개인 SNS 계정을 통해 결별 소식을 알렸다. On the first of november, it seems that the samsung galaxy players, who were in charge of … the esports LoL, are leaving. Starting from midnight, Samsung Galaxy White Koo “Imp” Seung Bin, Heo “PawN” Won Seok and Choi “Dandy” In Gyu, as well as Samsung Galaxy Blue Kim “Deft” Hyeok Gyu posted the news of their separation on their personal SNS accounts. 삼성 갤럭시 화이트의 원딜 ‘임프’ 구승빈은 프로게이머 활동을 했던 3년동안 얻은 것과 잃은 것이 많다는 내용과 함께 부족한 부분을 채워준 팀원들에게 고마움을 표현했다. 동시에 팬들과 삼성 사무국에게 미안한 마음을 드러냈다. 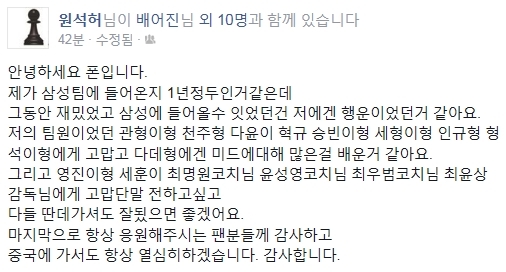 Koo “Imp” Seung Bin from SSW expressed his gratitude towards his team mates who helped him and also said that he had gained and lost a lot during his 3 years of progaming. At the same time, he gave his apologies to the secretariat of Samsung and to his fans. Hi, this is PawN. It’s been around a year that I entered SSW and all this time was fun and I was lucky to be able to enter the team. I am thankful to all my teammates and I learned a lot about mid from Dade. I also wanted to thank all the coaches and it would be nice if everyone could be fine. Finally, I thank all the fans who always supported me and I will always work hard to go to China. Thank you. 곧이어 글을 게시한 ‘폰’ 허원석은 삼성 LoL 게임단에 입단하게 된 것은 행운이었으며 같은 팀원들과 코칭 스태프에게 감사함을 표했다. 또한, 중국에 가서도 항상 열심히 하겠다는 표현을 통해 해외 진출을 암시했다. Soon after, Pawn expressed his gratitude towards his teammates and coaches and how lucky he was to have joined the SSW LoL team. He also hinted that he would be going abroad by saying that he will always work hard in order to go to China. I don’t know what will become of our team who was like a family during those 3 years. Kkkkk A world where we’ll all go to a good place? It would be nice if I could still see you. ‘댄디’ 최인규 역시 삼성 갤럭시 소속으로 활동했던 시간과 팀원들과의 추억에 대해 언급함과 동시에 응원을 아끼지 않은 팬들에 대한 고마움을 표현했다. 또한 좋은 기회로 다시 찾아뵙겠다는 말을 통해 추후 은퇴가 아니라 선수 생활을 이어가겠다는 의지를 드러냈다. Choi “Dandy” In Gyu speaks about his memories with his teammates and about the time they spent when they were in Samsung Galaxy. He also expressed his gratitude towards his fans who cheered for him. Also, while saying that he will look again for a good opportunity, he showed his willingness to continue his progamer life afterwards and not retire. 마지막으로 삼성 갤럭시 블루의 원딜인 ‘데프트’ 김혁규 역시 개인 SNS 글을 통해 팀과의 결별 소식을 알렸다. 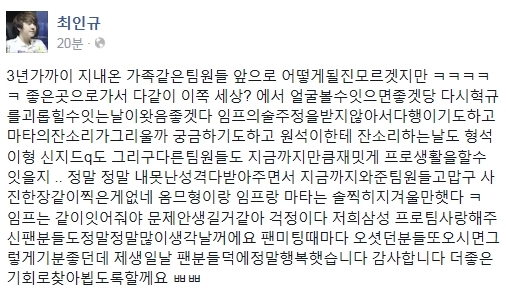 김혁규는 팀원들과 코칭 스태프에 대한 고마움을 표현하면서 ‘폰’ 허원석과 마찬가지로 중국 진출에 대해 언급해 팬들의 이목을 집중시켰다. 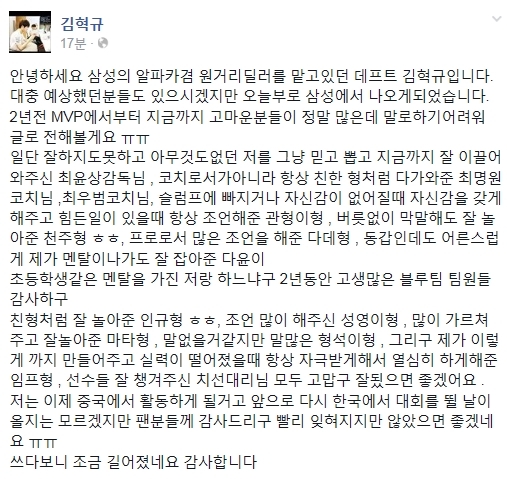 Finally, SSB Kim “Deft” Hyeok Gyu informed us of his parting with the team through his personal SNS account. He expressed his thanks to his teammates and coachs and mentioned that he would also be going to China which caught the attention of his fans.